From providing a personalized and unique experience for each guest, to managing back office requirements around finance business initiatives, the hospitality and leisure industry experiences a number of crucial challenges every day. More significantly, they experience front office challenges of offering real-time business initiatives through enhanced guest satisfaction via social media, mobility and the ever-changing channel distribution systems. This, together with the real-time information for stakeholders and the need for greater transparency, means that embracing change and new technologies is critical. 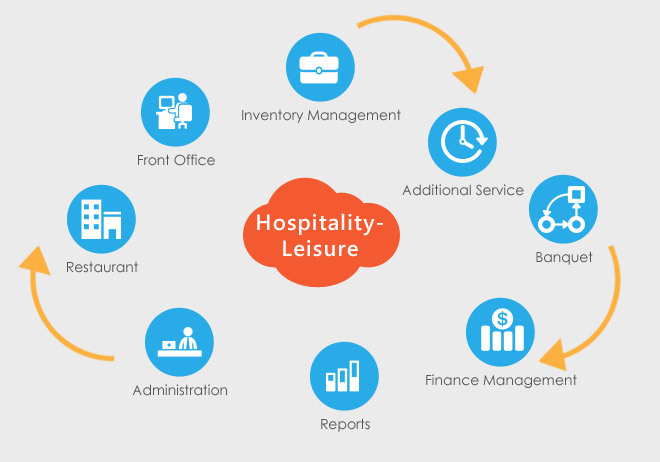 Swash provides excellent cloud based ERP solutions for Hospitality & Leisure industry. Swash offers solution that provides the growing sector with tools to grow the business thereby streamlining their multi-unit operations. While keeping up with the need to integrate and transact with booking platforms, mediators, and multiple systems the Hospitality & Leisure is constantly challenged to manage operational costs and meet the requirements of more tech savvy customers that demands for everything. Our domain landscape encompasses car rental companies, holiday planning portals, event management companies, restaurants, cruise liners, clubs & recreational facilities, casinos and hotels. Our Hospitality & Leisure solutions are effective, save time, provide convenience and avoid problems like double booking and other minor mistakes that prove to be hazardous in the long run for the hospitality sector. Our advanced delivery models and technological process provides an extra edge to this ever-booming industry to be ever profitable and ready for every challenge which the industry faces time and again. To get more details about Swash's technological platform, development and models, click here. Hospitality & Leisure businesses are increasingly choosing to automate processes as technology is making deeper inroads into this industry. Business owners must choose to either access it in a siloed manner or integrate the solution into their property management system at great expense while there are a number of software and solution sets to manage hospitality and leisure business functions. With our Hospitality & Leisure solution can enhance resource planning, guest profiling and demand forecasting by obtaining real-time data from multiple sources. The solution goes beyond traditional ERP to provide business intelligence, financial management and more. Our Hospitality & Leisure practice provides integrated solutions to help attain maximum productivity within your business. In order to facilitate convenient business / leisure travel, core business applications can be enhanced with location-specific data, for instance local directory listings, restaurant menus, maps and driving directions. To engage millennial travelers your customer experience management strategy can be augmented with social media. We provide solutions to manage your business effectively. Here are some of the important features of our Hospitality & Leisure solution. Hospitality & Leisure solution you can easily manage your front office activities. These include, hotel room booking, check in and check outs and more. While improving your overall guest services this also helps you manage your daily operations. This feature will allow hotel chains to effortlessly switch amid all the linked hotel locations and view the booking status separately. Our software can also be accessed through smart phones or tablet allowing you to keep track of all the operations no matter where you are at any given time. The one system allows you to manage multiple hotels from a single login. Take care of all your bookings, online distribution information, reservations and much more of different hotels from a single dashboard. You can get complete analysis of all the back-end and front-end operations of your hotel from reports. As per the requirement, diverse set of reports can be generated in the system, from arrival list to revenue related reports, to cancellation reports and reports giving you reservation statistics for Facebook, Desktop and Mobile.